Located in Rothéneuf, on the coastal road that runs from St. Malo to Cancalé in Brittany, France, the site Les rochers sculptés is a well known classic. This art environment was created by Adolphe-Julien Fouré (1839-1910), who was a priest and generally is known as Abbé Fouré. 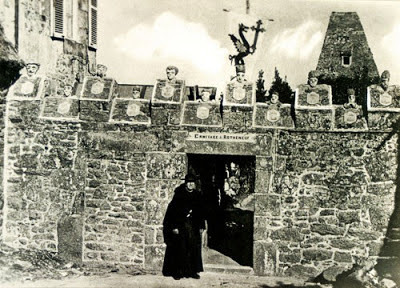 Born in Saint-Thual, Fouré as a young man studied at some seminaries, was ordained as a priest in 1863 and worked in a number of communities in Brittany, among other in Paimpont where he was rector for some years.. In october 1893, in his fifties, he settled in the small community of Rothéneuf, on the north coast of Brittany, not far from St Malo, where he rented a simple cabin. The legend says that he, after a stroke which made him deaf-mute, no longer could fulfill his clerical duties and so decided to retire as a priest. Recent research by the Association of friends however demonstrates that Fouré was relieved from his duties by his superiors and had to leave after they did not appreciate a firm position the priest had taken in a local conflict. 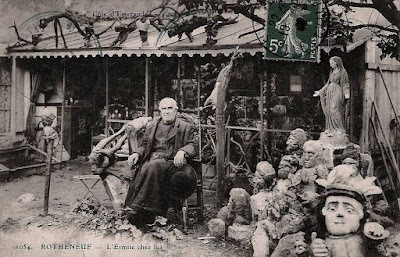 In 1894 Fouré began making sculptures, both creations from stone, displayed on the exterior facade of the cabin and wooden creations, displayed in its courtyard and interior. So his house became kind of a museum and since in the region tourism had begun to develop, the site attracted tourists. 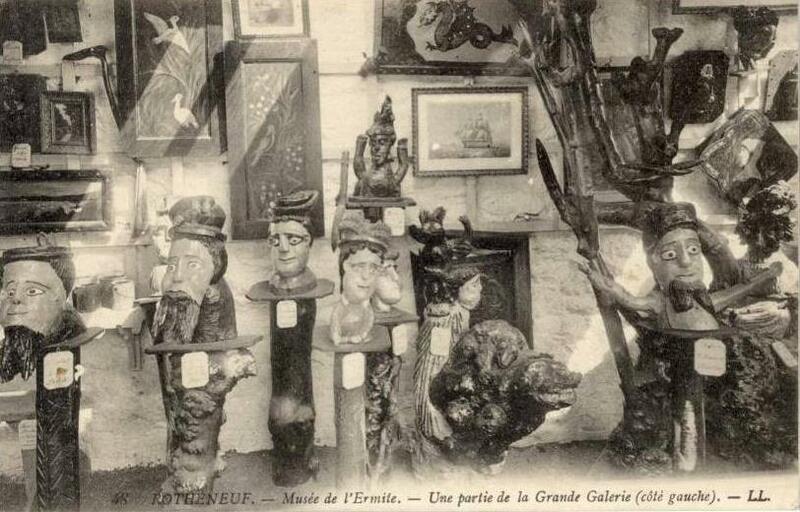 wooden sculptures inside the house, the "Grande Galerie"
Fouré became known as the hermit of Rothéneuf, although one can wonder if he led a lonely life. He would be present at the premises, selling postcards which showed him and his creations. The revenue went to the local poor. During the priest's lifetime some 400 different postcards have been made. 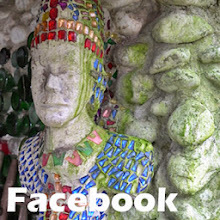 Currently the priest is mostly known because of the around three hundred sculptures he carved into the rocks along Rothéneuf's coast. These sculptures represent folklorist, religious and historical themes, for example the Virgin Mary with nations at her feet, or impersonations of all kind of people related to the past of Brittany (among whom, but not exclusively -as legend says- a family that in the 16th century happened to live in that area and had a reputation of bandits behavior and piracy). 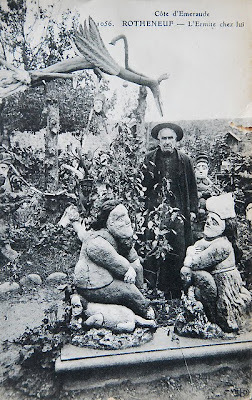 Abbé Fouré stopped carving rocks in 1907, but he continued making wooden sculptures until his death on February 10, 1910. After he died his belongings were auctioned. The furniture was bought by various people and some items of this furniture nowadays are still available in art galleries. The wooden sculptures did not attract so much interest. Most items have been bought en bloc by the owner of the cabin, who had the purpose to let them stay in situ. However, the cabin/museum has disappeared, and so have all wooden sculptures¹. This probably happened in the period during world war II (around 1944?) when the french northwest coast was a military zone (to prevent an eventual allied invasion) where the civilian population was deployed. Currently the sculptures in the rocks are still extant, but the site hasn't a protected status and the creations gradually become affected by the weather and the visitors. Originally painted, meanwhile they have lost all color. 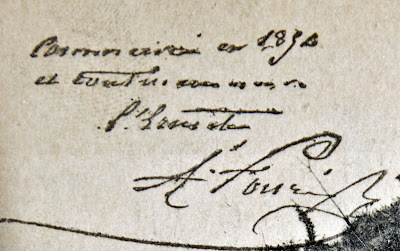 The Abbé kept kind of a guest book in which visitors or he himself could write remarks and/or make drawings. This Livre d'or (golden book) was donated by the family to the Association of friends of the oeuvre of Abbé Fouré. More pictures on the weblog lesgrigrisdesophie of February 4, 2012. Presided by Joëlle Jouneau the association Les amis de l'oeuvre de l'Abbé Fouré, founded in 2010, documents Fouré's life and works, organizes expositions and meetings, and promotes the preservation of the site. They have a website (in french). In the summer of 2013 mrs Jouneau was interviewed about the activities of the association. The text of this interview is in my collection of OEE-texts. * Noguette, La vie de l'Ermite de Rothéneuf, St. Malo, 1919. This brochure by Eugène Herpin, 1850-1942, has been republished on Bruno Montpied's weblog. A translation into english in OEE texts. 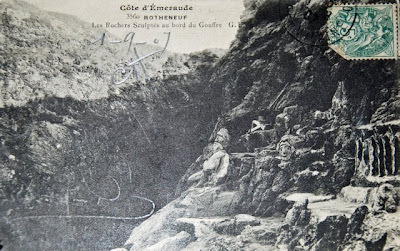 * Another early 20th century text is R. Brooks Popham, The hermit of Rothéneuf, 1912, also republished in OEE texts. * Trailer on You Tube of Frédéric Daudier's l'Homme de granit (2002, 52 min, Arcanae Productions (can be ordered on DVD). * Some panoramic postcards on Jean-Michel Chesné's weblog (19-1-2011) These special pictures can be enlarged and give a good impression of the vastness of the site. * In 2013, at the occasion of the manifestation l'Art brut à l'Ouest in Brest, Britanny, with the cooperation of the Association of Friends, an exposition about Abbé Fouré, "as you have never seen him before" (april until end of june 2013). Thank you so much for such an interesting Blog and information about so many fantastic Outsiders Artists; it is most appreciated!. Also all my thanks for such a nice presentation of the Abbé Fouré.As a French I really appreciate this article. Yes in a way he is well known or should I say was well known. 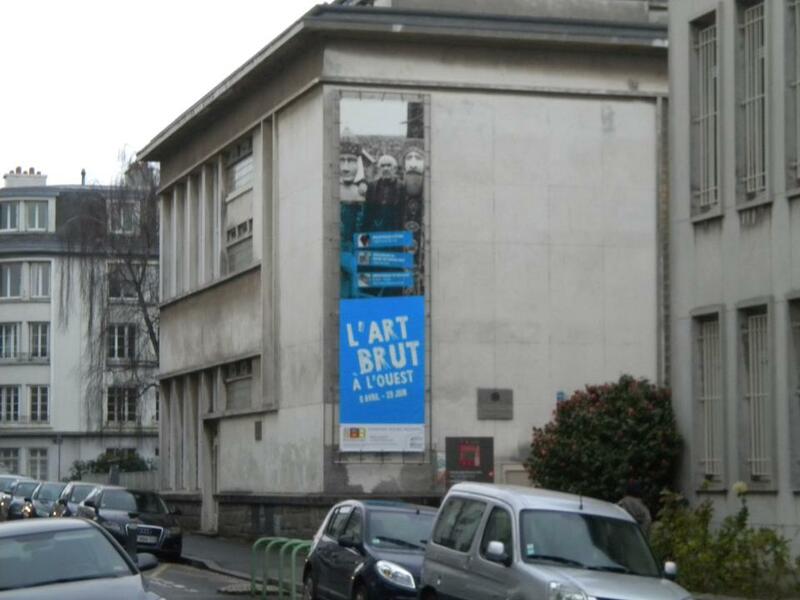 Thanks to a new French Association: 'L'Association des amis de l'Oeuvre de l'Abbé Fouré' which tries to protect his Master piece and also wishes to bring people to re-discover his work and life. The Blog has put a few information and an advert on exhibition at the Forges of Paimpont in February this year. 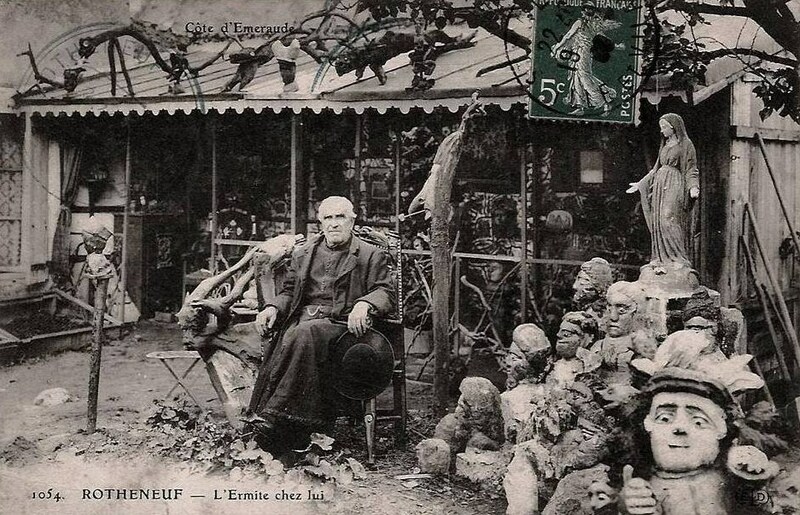 The Abbé Fouré sculpted the Rocks of Rothéneuf during 25 years. During this time he also sculpted some 3 to 400 drift wood sculptures. Most of them have 'vanished', supposedly burnt during the war, but one has turned up when there was an exhibition for the 100 years of his death, and another one is actually exhibited in the LaM museum, in the North of France at Villeneuve-d'Ascq, a newly re-opened museum which has the biggest collection of Art Brut in Europe. A very nice article about the Abbé was also written in PostCard monthly magazine in UK No391 of November 2011. Thanks again, I will come with more information soon. Thanks a lot for your interesting comment. It is my intention to announce the upcoming exposition in Paimpont in one of my next posts. The postcards in Sophie Lepetit's blog are very nice indeed. During the abbé's lifetime these were the favourite medium to inform the general public about these sites. Thank you SO MUCH for the article and reference literature concerning mesmerizing creations of Abbot Fouré! I dared to translate the essays into Russian, for the readers of my blog: http://elenakuzmina.blogspot.com/search/label/Abbot%20Four%C3%A9. Of course, with the links to the sources - your blog, as well as original texts, photo sources, etc. Thank you again - yours is the most complete collection of materials about the Abbot I could find in English.